BSNL Mobile has announced new Prepaid plan name ‘YUVA’ across Gujarat Telecom Circle as promotional basis for a period of 90 days. State run Telecom Company Bharat Sanchar Nigam Limited (BSNL) has introduced new ‘YUVA’ Prepaid mobile plan for Gujarat Telecom Customers as 2016 Promotional offer basis. BSNL targeted youngsters to gain more YUVA customers where this plan comes with Rs.149 Plan voucher. Customers to get this new Prepaid plan have to reach nearest Customer service center to get new connection at Rs.20/- (Sim card cost) and recharge with plan voucher of Rs.149/-. 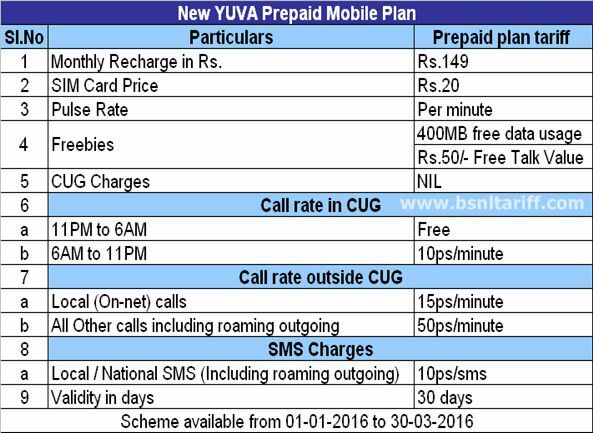 New YUVA Prepaid plan features, Free 400MB data usage + Rs.50/- talk value for voice calls under per minute tariff. For voice calling all Local (On-net) calls at charged @15ps per minute, all other calls (Off-net) including Roaming outgoing charged @50ps per minute. Customers will be charged 10ps per SMS for both Local/National SMS (Including roaming outgoing). In addition to this customer will benefit Free voice calling from 11:00pm to 06:00am and 10ps per minute from 06:00am to 11:00pm under CUG (Closed User Group). YUVA Prepaid plan comes with validity for 30 days. The above Prepaid plan will be implemented with effect from 01-01-2016 available upto 30-03-2016 for a period of 90 day as promotional basis. This plan is applicable only in Gujarat Telecom Circle.